First, I see FC as an open world sandbox for having fun and not some game with a deep sprawling story, I have my fair share of JRPG’s for that. I see the story campaign, characters as a premise/setting to give context to the actions we do in the game, that’s all. I did not like FC4 since it felt ditto to FC3 for me in terms of the gameplay and the outpost system was just too boring. 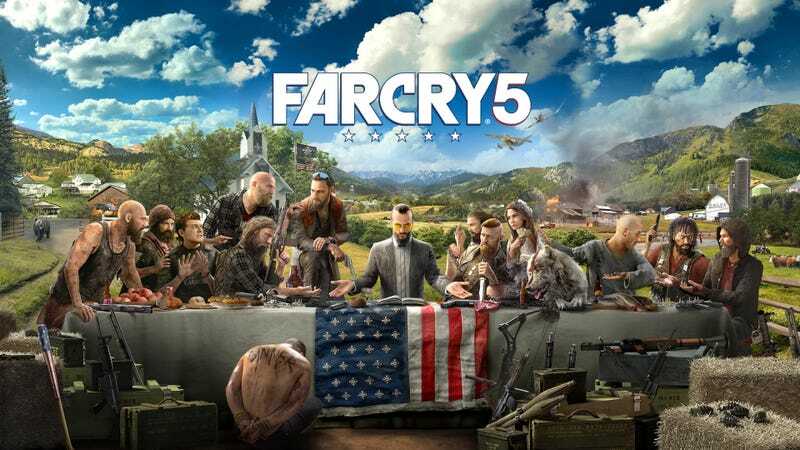 I went into FC5 thinking it is going to be the same with few minor changes, but I was wrong. They have tried to do as much as possible changes to the gameplay formula while retaining the identity of the series - which is you are put into a dire situation against a maniac type villain, you have to overcome all obstacles. The campaign setting and quest structure makes a lot of sense here and keep things fresh. I do not know much about American politics so I can’t comment on how this game handles that. What I know and have seen is fake religious gurus or preacher or whatever you want to call brainwashing people. This game is about that ( minus the violence part). In the fc4 and 3, you were thrown into a conflict and you will act as the all-rescuing-super hero for the people in that region. Here that is present (which is necessary for an FC game) but in a very very reduced extent. About 80% of the quests I have played the other rebels of the region fight with me. Which brings me to the questing system. This is frankly the best AI companion system I have seen in recent years. You can have animals or people as your companion. There are specialists with unique weapons and perks who you rescue in-game world and also normal people who are called guns for hire. As I said above all of the people you help you can hire them to come with you and fight. And damn they are awesome! They comment about stuff in a funny manner, respond to events happening around, do some witty remarks of your actions, talk with other NPC in the world, fight along with u in the style you want. They are not like invincible, also if they die you need to revive or they will spawn after some time. You form a very good bond with them, they never get in your way in any dumb manner. They come in vehicles with you and use the mounted weapons, each has their own special perks that help you etc etc.. Overall they are really well done.Same goes for the three animals you can have dog, bear, and cougar. Final Thoughts: There is no set path to play this game, there are 3 regions with 3 sub-villains. The tedious things like plucking every single plant you see are gone, the perk system and crafting are more streamlined. These regions are huge, you have to go there get resistance points by doing a mission which will unlock villain quests. You get complete freedom in this sandbox because doing all of the activities give u resistance points so you can always choose what to do. In my first region, I only liberated 2 outposts out of like 10 and did more character stories still completed that area. now in my second area, I’m trying to do outposts in stealth. There are few scripted story missions but they only serve as a tool to get things flowing in the game. This freedom combined with great choice of weapons, vehicles, extra side activities like finding stashes, stunt races, fishing etc everything makes sure I’m not bored for even a second. I’m always thinking which next character to meet, and what interesting side quests I will get because it genuinely feels like you are helping these people against a cult and forming a resistance. Also, it’s surprisingly polished with no funny bugs or any bugs at all. The villains and their dialogues add more flow to all of this but they could have been better. It’s the idea of this cult that gives me a scared atmosphere rather than these villains. The enemy spawns can get irritating at sometimes, we can’t modify the companion weapons to have suppressors or anything, some enemy faces and civilian faces look same, some odd texture pop-ins. Overall I feel this is the best FC game and I’m having nonstop fun, didn’t get bored a single moment in my 15 hrs play through so far. If you are looking a game to have non-stop fun with blowing, shooting stuff, doing the side activities in a sandbox, without feeling bored or repetitive this game will be a perfect choice. In console using the map editor is bit clunky and difficult due to controller input. I read that in PC map editor creation is really good. There are community maps & Ubi developed maps. Each has different objectives, modifiers - 1 hit death, no enemy markers, specific weapons, victory conditions etc. Its fun to play solo & coop and is like a good side activity to the campaign.The good part is that the money & perk point you get in arcade mode carry over to main campaign.. so that’s a plus. This and multiplayer are the side attractions and shouldn’t be your main draw to the game (always has been a side attraction to FC games). I initially thought this will be like Assassins creed origins where there will be a loot box and also some weapons locked behind MT. But to my pleasant surprise, it’s not like that here. There is no loot box. Some vehicles, weapons are available to purchase with real money (these can also be purchased with in-game cash), but they are just a skin variant of existing weapons and items in the game. You unlock a lot of them just by playing missions itself, so the MT’s did not bother me at all. Was it too soon for DoTA 2 to be Reborn ? ?